Causal Patterns in Air Pressure is a curriculum module for teachers who want their students to develop a deep understanding of air pressure concepts. Research shows that students who are taught about the nature of the causal patterns while learning science achieve deeper understanding than students who learn the science concepts only. This curriculum module is designed to address persistent difficulties students have when learning about air pressure. These difficulties stem from how students reason about the nature of cause and effect. The module consists of nine lessons, organized into three sections. 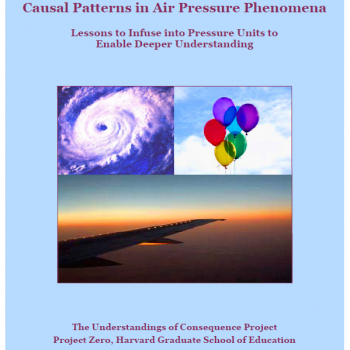 Each section introduces one of three ways of thinking about causality that students need to master in order to develop a deep understanding of air pressure. Each lesson contains understanding goals for the subject matter and causal patterns. Background information helps teachers recognize the misunderstanding and how it is typically revealed in students reasoning about air pressure. RECAST (REveal CAusal STructure) activities are designed to reveal the underlying causal structure of concepts and to help students restructure their understandings. The curriculum incorporates best practices in science education, such as inquiry-based learning and modeling. It is designed for middle school but can be modified for use with other ages. The module can be infused into broader units on pressure. It was developed as part of a research project called the Understandings of Consequence Project, which is supported by the National Science Foundation.